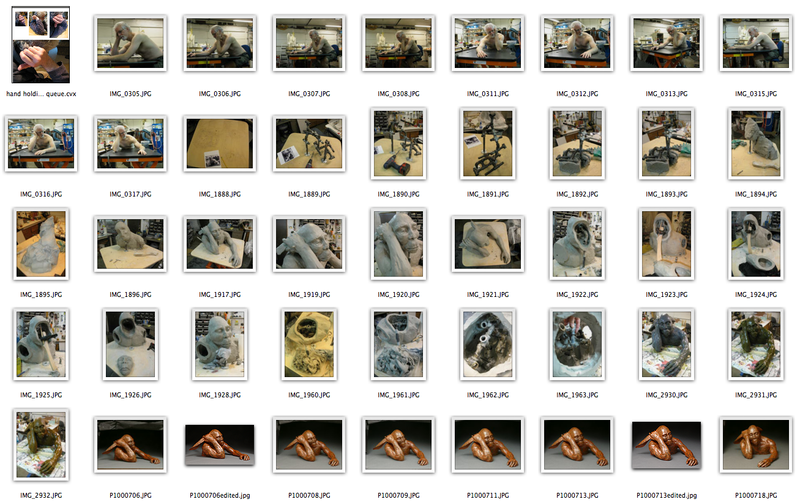 Attic Gallery says a collector is interested in my “66,000 Generations of Reason” and he’s curious how I made it. So I sent the above screen capture (from my Mac finder) to the proprietor today. It’s pretty low res, but gives a general idea of the steps involved. The gallery said they printed out some copies to have on hand for anyone else interested in my work. sorry…i’m just catching up on your blog…but this is cool! i really like seeing this whole process like this. it’s a work of art in itself to see all the pieces and how it all works together to create art…but it’s art at every stage. Hi Steve, I am very happy to have found your blog. I used to , visit The Attic Gallery, to go mostly to see this lady sculptor’s work, that I got a lot of good medicine, out of looking at, then I started seeing your work in there, I Love Rabbits and liked to visit, your sculpture. I told the lady at the gallery that you and this lady were my favorite modern sculptors, Then she told me that you all were a couple, I thought that was pretty wild. I really like the titles that you come up with. Peace J.A.M. I’m glad you have experienced our work as “good medicine”! I like that 😉 And yes it is “pretty wild” for Jackie and me to be an artist couple — it’s been a wild path made much more fun by traveling it together. We walk in gratitude. Thanks for viewing and your comments.